A historical museum is a facility that by its very nature is a collection of collections. This realization inspired the Beaver Area Heritage Museum’s 2014 exhibit: Beaver Collects. Fascinating, colorful displays highlight the unique and eclectic treasures of myriad local collectors from right here in our own neighborhoods. Come learn some of the collectors’ stories and insights, in their own words. Beginning in March, the displayed collections will change every few months throughout the year, until the museum closes for the season in early December. St. Nicholas – Born in Patara, a land that is part of present-day Turkey, circa 280, St. Nicholas was a Christian bishop who helped the needy. After his death, the legend of his gift-giving grew. St. Nicholas transformed into the legendary character called Santa Claus, who brings Christmas presents to children around the world. 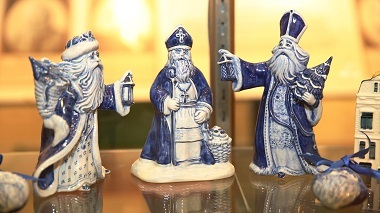 The Dutch continued to celebrate the feast day of St. Nicholas, December 6. It was a common practice for children to put out their shoes the night before. In the morning, they would discover the gifts that St. Nicholas had left there for them. Dutch immigrants brought St. Nicholas, known to them as Sint Nikolaas or by his nickname Sinter Klaas, and his gift-giving ways to America in the 1700s. Miniature Beds – The five beds featured are all vintage as are most of the bed coverings. Many of the bed linens and spreads were made by the owner. 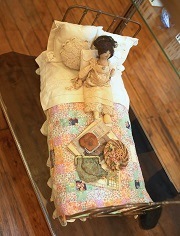 The “penny” quilt however and lace linens were fashioned by a dear friend so were the two dolls with oak “door stopper” heads. (One of these was in the Smithsonian folk art collection.) Note the breakfast tray and straw hat, both handwoven from pine straw. The clam shell pattern coverlet on the high back Victorian bed was knit in #1 needles. It sleeps two Waldorf School dolls made from recycled wool sweaters. The small ridged spread is also of knitted cotton. The bed is made of clothes pins. The 9 patch quilt on the brass bed made from prints of the 30’s and 40’s. The smallest quilt is done in the cathedral window pattern. Dolls! Dolls! Dolls! – Now that the lender is too old to play with dolls and doesn’t want to give them away, she has become a doll collector. It’s another way of playing with them for the rest of her life. There are many dolls made of composition — a mixture of paper, wood pulp, glue and sometimes plaster of paris for extra strength. Her first doll, a gift from a favorite Aunt Polly, is a horseman doll named “Sister.” Her name and date can be found on the back of her neck. Many years later, the lender’s daughter found “Brother” on eBay and presented him to her for Christmas. 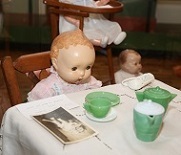 They are on display at the childhood table and chairs. Other composition or rubber dolls are displayed in a cradle, bunk beds, high chairs, and playpen. Another popular doll dorm the 30’s is the Effanbee doll formed by Bernard Fleishaker and Hugo Baum around 1910. They combined the F&B and spelled it out to form EFFANBEE. Ideal doll company made many popular dolls, especially “Betsy Wetsy” which was introduced in 1937 with hard rubber heads and soft rubber bodies and limbs. Many people are familiar with the Alexander Dolls which are still made today. The company was formed by Beatrice and Rose Alexander in 1912. 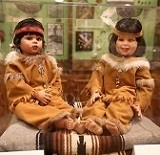 On display is one of the Dionne quintuplets, “Annette.” Other Madame Alexander dolls are “Wendy-Kim” , an eight inch doll and two Indian dolls — “Tiger Lily” and “Pocohontos.” And if you like Indian dolls, you must see two large ones — “Shy Moon” and “Happy Heart” — organized by Fay Zak Spanos. Everyone knows Cabbage Patch dolls. “Renew Etta” designed by Xavier Roberts is a 22 inch original adopted from the Babylon General Hospital in Cleveland, Georgia on April 10, 1991 — look at her fabulous hair! Don’t forget the Kewpies created from the drawings of the American artist and poet, Rose O’Neill who said the kewpie were inspired by a dream. The first ones had hands with a starfish shape and tiny blue wings. Rag dolls are one of the oldest toys in the world. See Raggedy Ann and Andy — actually more than one of each. 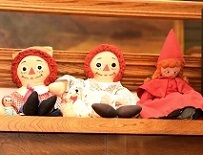 The Raggedy Ann and Andy dolls were created by Johnny Gruelle in 1915. And ask one of our greeters to show you the Little Red Riding Hood, Grandma, and the Wolf — all in one — doll! Deldare Pottery – Deldare Ware was made by Buffalo Pottery of Buffalo, N.Y. in the early 20th century. It was a specialty item made for the Larkin Soap Co., offered as a premium for the purchase of its soap products. This was an early example of direct marketing via “home parties” whereby the host earned points for the sales she made. There are two themes — the fox hunt titled “The Fallowfield Hunt” with seven scenes — and village life titled “Ye Old Village” with eight scenes. This collection is on loan from Judy McCleery Knaul, begun with the large pitcher inherited from her mother, Louise McCleery. Native American Relics – Ira F. Mansfield was a prominent citizen of Beaver and a successful coal operator in Darlington Township. His chief product was cannel coal which was marketed as far away as Philadelphia. He collected Native American relics and artifacts both locally and from Western states. When he died in 1916, his collection became the property of his widowed daughter in law, Mabel (Hamilton) Mansfield. She later married Henry C. Cronemeyer, a Jones & Laughlin Steel company engineer who inherited the collection after Mabel’s death in 1966. It was stored in the basement of their property at 266 College Avenue, and as Cronemeyer considered that it had little or no value, he gave it away to local businessman John R. McLaughlin Sr. After extensive cleaning, they became beautiful exhibits. Beaver Rotary Club to Serve as Volunteer Greeters – For the fourth straight year, as part of its enduring commitment to furnishing community service, members of the Rotary Club of Beaver will serve as volunteer greeters four times during the exhibit season.  Corporate Sponsors – Strassburger, McKenna, Gutnick & Gefsky (Gold) – Huntington Bank (Silver) – c3controls (Silver) – Eaton Corporation (Bronze).